As you may already know by now, Apple has officially made iOS 11.0.2 available to download for all users in ownership of a compatible iPhone, iPad, or iPod touch device. Here are the official release notes which accompanied that release, providing Apple’s perspective regarding changes, improvements, and any feature or security additions where applicable. The life of an Apple employee or engineer is likely to be a busy one at the best of times given the scale of the business and how fast-paced the environment is. 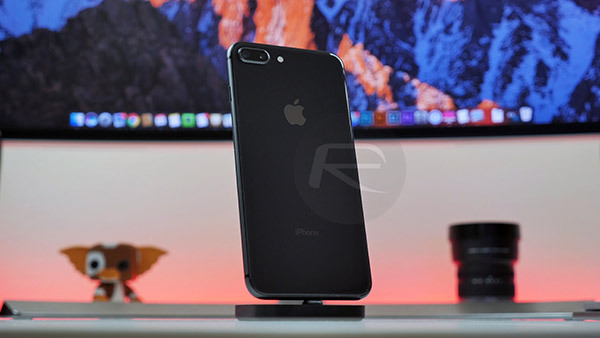 However, things have been ramped up to the next level recently with the initial release of iOS 11, watchOS 4, tvOS 11, macOS High Sierra and the announcement of iPhone 8, iPhone 8 Plus, iPhone X, Apple TV 4K and Apple Watch Series 3. For Apple’s engineers involved in the build and progress of iOS 11, it’s pretty much accepted that working under pressure and to deadlines is part of the job description. Those deadlines have once again been realized in a timely fashion with last week’s release of iOS 11.0.1 and today’s subsequent release of iOS 11.0.2. The initial versions of iOS 11 has only been with us for what feels like a few days, but Apple’s engineers are already ripping through support requests and known problems, bugs and issues with the aim of getting new builds out into the hands of device owners to fix those discovered issues. This iOS 11.0.2 release is exactly that, a smaller point release which instantly introduces bug fixes, generic improvements, and stability enhancements that should hopefully set the scene for larger releases going forward. In short, Apple has reacted quickly to try and fix some niggling issues that have been picked up in iOS 11.0 and 11.0.1 releases. 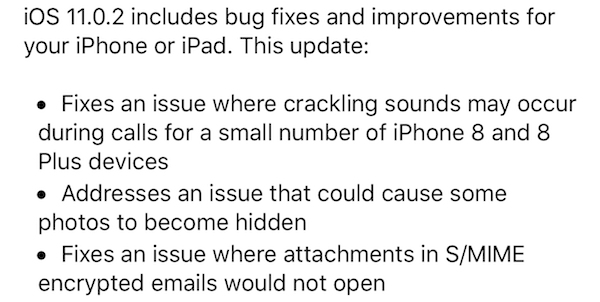 So yes, iOS 11.0.2 does fix crackling sound issue experience by some iPhone 8 and 8 Plus users, among other minor bug fixes. Which means that iOS 11.0.2 has exact same security patches as 11.0, but includes bug fixes and improvements for iPhone, iPad and iPod touch users. 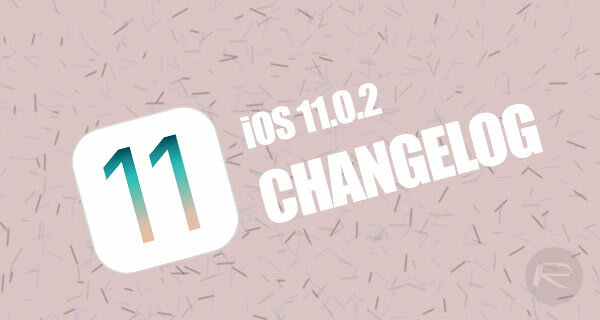 Hopefully, the issues related to performance, battery and general lag here and there in 11.0/11.0.1 has also been fixed in this update once and for all. We will report back with our findings when we have spent enough time with iOS 11.0.2. Stay tuned for more. Change to appstore reviews? I really don’t care about reviews from five years ago. Passcode lock coming for Files? Little things bugging me even though I like this ios! The author of this post (Morris) must be paid by the word. Remove the wind, and the information fits in one sentence. Worst note ever,iOS 11.0.1 includes bug fixes and improvements for your iPhone or iPad. The ability to change the 5 BAR display over to Signal Power in dBM is GONE GONE GONE. You used to be able to press PHONE and “DIAL” the number *3001#12345#* to enter the Field Test Mode to switch the bar display to the far more sensitive dBM display. NO MORE. This type display, with its enhanced sensitivity, allowed you to possibly find a spot in a very weak area to make an emergency “911” call in need be. SO BAD that is now GONE. BTW, “How” to I enter a comment w/o having to ‘Reply’ to someone else’s? 🙂 Iy’s not all that obvious? Can anyone report on battery usage? I’m on 11.1 beta 1 and it’s awful on my iPhone 7 Plus.